Washington DC Bad news for the Prez, he’s got yet another approval rating to worry about. We’ve been watching his every meal… burger after burger, bite after bite, and believe there’s some serious room for improvement. We dug into his dining record and put together some advice for how he AND you can do better when it comes to dining out in DC. Obama’s Order at Lincoln: Mr. President went for a cheeseburger and kale salad with lemon vinaigrette when he dined at this equally presidentially named restaurant with a quartet of winners from a "Lunch with Barack" contest. 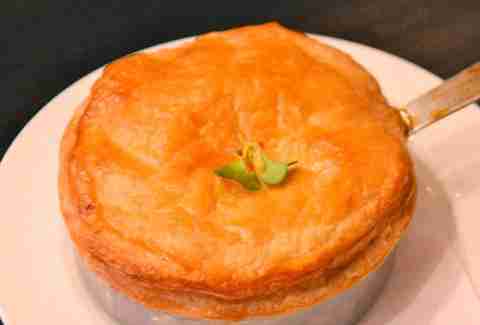 Better Move: Chicken Pot Pie. Yes, over the burger. Crazy you say? Trust us, Lincoln's crust is thick and buttery, and the luscious filling is a far cry from that Stouffer's gelatinous paste you may have suffered through in darker times. It'll give you the energy you need to fist bump janitors and fill out the meanest of March Madness brackets. Obama’s Order at Boundary Road: At yet another campaign supporter thank-you gathering, Barry O had himself a hanger steak with seasonal vegetables. Better Move: Foie Gras Torchon PBJ (homemade peanut butter and grapefruit Malört marmalade). Congrats for putting down the cigs, but The Renegade needs another vice (the bad habit, not-Biden variety). Foie gras, that’s a good one. 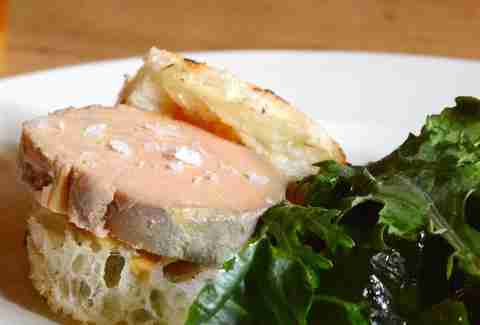 You’ll curse your mother for never inserting luscious goose liver into your schoolyard snack. Bonus: it would have been entertaining to watch PETA lose its collective mind after he ordered this. 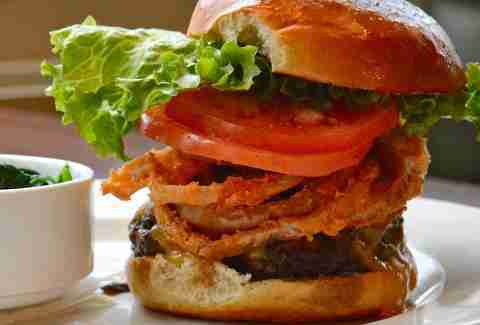 Obama’s Order at The Coupe: While dining with some young folks helping him with outreach surrounding the Affordable Care Act, Obama nonetheless indulged his beef cravings again with The Coupe Burger -- a patty topped with sautéed mushrooms, cheddar cheese, and fried onion rings. Though he did sub sautéed spinach for fries. Better Move: Pensacola Pâté. Okay, guy who orders a burger in every restaurant, let’s expand your horizons just a tad to this dish which is actually just code for some fancy pants meatloaf. The Coupe’s Pensacola Pâté leans a little redneck, but IT’S WRAPPED IN BACON. 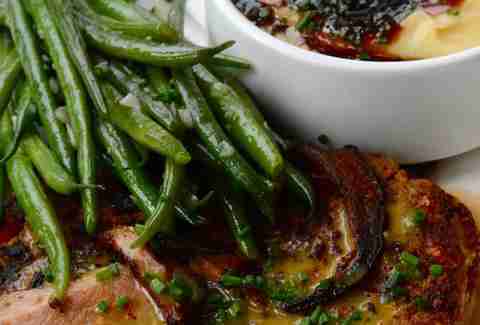 The ‘loaf is coated with a honey Dijon glaze and served with silky taters, gravy, and green beans. Obama’s Order at Taylor Gourmet: Obama and Biden made a joint visit (not the Obama in his carefree younger days kind) to Taylor to show gratitude for their decision to provide a discount to furloughed employees during the shutdown. 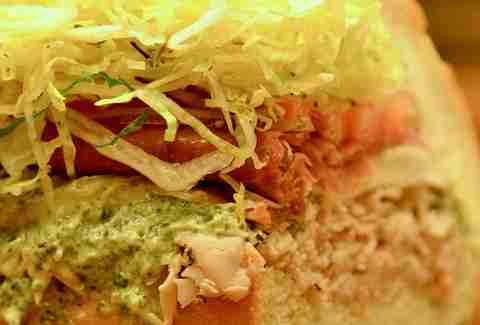 The Commander In Chief went with the Race Street, sporting roasted turkey, prosciutto, pesto, and mozzarella cheese. Better Move: Federal Street. 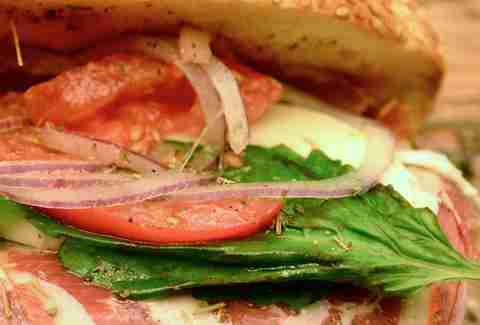 This aptly named meatwich is layered with pepperoni, dried capicola, hot capicola, Genoa salami, roasted tomato vinaigrette, basil, and fresh mozzarella. An obvious upgrade from a lettuce nest and not-so-exciting turkey. This is TG’s best Italian, and may just help the Commander in Chief make nice with all the feds who day drank endured sequestration. Obama’s Order at The Liberty Tavern: Another American-sounding establishment for another meal meant to thank a handful of supporters. 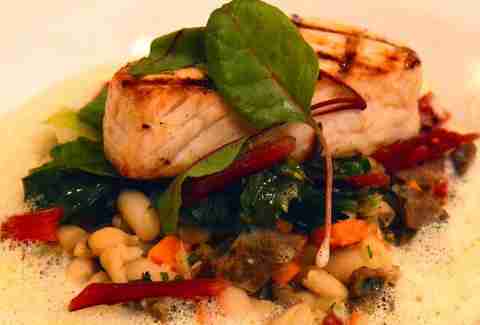 The President went with line-caught swordfish with a white bean, sweet pepper, and Italian sausage ragu perched atop escarole and pickled Swiss chard swimming in clam froth. 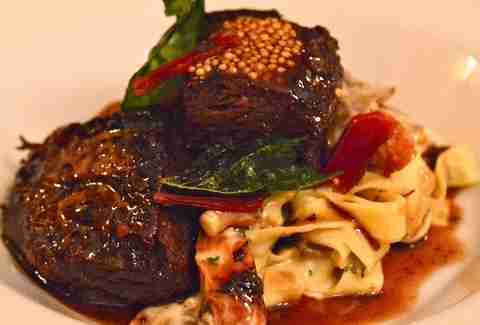 Better Move: Pineland Farms beef short ribs served with egg noodle stroganoff, heirloom carrots, and pickled mustard seeds. 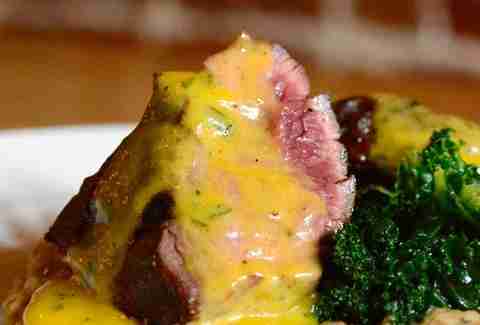 The Prez is practically withering away in the White House, he clearly needs something heartier, like this tender short rib perched atop creamy stroganoff. Taft would have been all over this. 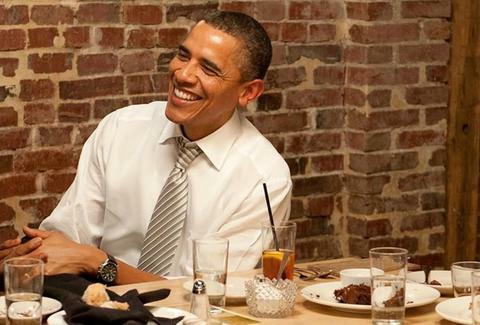 Obama’s Order at Good Stuff Eatery: The man likes his burgers! At a lunch to thank staffers for their work on debt negotiations, he went for a plain old cheddar cheeseburger. Better Move: Now this one’s just a crime. 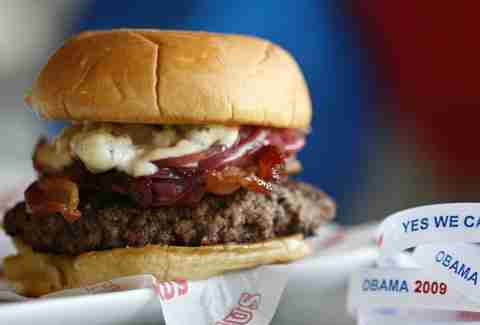 Good Stuff Eatery has a Prez Obama Burger. 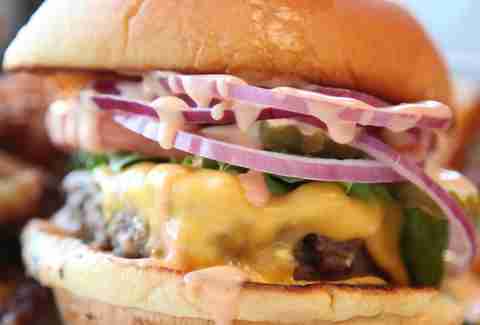 He skirted his NAMESAKE burger, which is hella more delicious than a plain old cheeseburger. 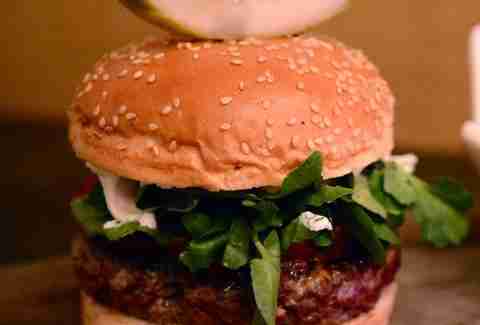 Spike Mendelsohn's POB is adorned with applewood bacon, onion marmalade, Roquefort cheese & horseradish mayo sauce. Don't make the same mistake he did, even if you don't get the bonus joy of eating a burger named for you.